Saab dealers are opening their doors to models such as the Spyker C8 Aileron, shown. STOCKHOLM (Bloomberg) -- Spyker Cars NV, Saab Automobile's owner, plans to almost double the number of dealers selling its high-end sports cars this year by offering them through Saab outlets, CEO Victor Muller said. “We are signing up Spyker dealerships left, right and center,” Muller said in an interview at Saab's headquarters in Trollhaettan, Sweden. Spyker intends to boost its dealer network to 60 from 35 in 2010, and to about 90 by the end next year, as Saab dealers open their doors to models such as the C8 Aileron, which can reach 300 kilometers (186 miles) an hour and sells for $214,990 in the U.S., he said. 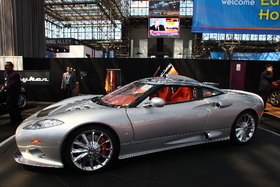 Spyker bought Saab in February from General Motors Co., completing a 14-month effort by GM to unload the company. The new dealerships will help Spyker, which sold 36 cars last year and has been loss-making since it went public in 2004, to become profitable, Muller said. The Dutch supercar maker has also started benefiting from lower prices for “generic” parts such as windscreen wiper motors that Saab gets through its higher volumes, Muller said, adding that Spyker plans to tap Saab's engineering resources.